Have you been to a wine tasting or just hanging out with friends trying to identify the nose or tastes of the wine you are tasting? There have been many times a group of us sit and sniff away. We try to identify the nose (particular scents) and all of a sudden someone will say, I detect Blue Berry or Plum. At that moment, you can relate to the smell and say, “Oh yes”, I can too! Chris and I like to watch “Hell’s Kitchen”. I think Ramsey is pretty cool and I like his style. I do think some of the contestants are not qualified and we wonder, why is this person on the show? On one his shows, he has the contestant blindfolded. The person must identify food by simply by the taste. One might think this should be pretty simple, but it’s not! We have become very dependent on our senses. As soon as we see a food we can immediately relate to the smell or taste. Right now think of an Orange or Banana. I can immediately envision what it looks like and think that I can imagine the smell or scent of the fruit. In my quest to keep finding those “Ah hah” wines, I too try to identify the nose of the wine. Many wines have a very sophisticated nose to them. Think of a Cabernet Sauvignon. I immediately think of Vanilla from the toasting of the barrel. The fruit that comes to mind is Raspberry and Black Cherry. How are the tannins? Now imagine a Sauvignon Blanc. I immediately think of Citrus, Lemon, and Peach. But as you know, many of these wines have many more scents that most of our “untrained noses” cannot detect. I decided a couple of months ago I wanted to “hone” my wine tasting skills. I knew I had to work on enhancing my “wine smelling nose“. I started searching on the internet for wine sensory/smelling kits. When you Google “Wine Sensory Kits” there are a plethora of kits ranging from inexpensive kits to making your own. I looked at the make your own and I did not like them. The make your own kits require you to purchase and store fresh fruits and vegetables in jars. Or they are temporary kits. If you are like me, this is not a one day experience. There are numerous aromas in the world and this is going to take the time to learn. I decided to skip the “Do it yourself” kits and looked at Aroma kits. I reviewed kits from Amazon.com, Wine Enthusiast, and others. The kits them self-ranged from the mid $50 range to hundreds. They also had White kits, Red kits, and kits that included both. After spending a week researching and reading reviews. I decided to purchase the Master Wine Aroma kit (54 aromas) from LE NEZ du VIN. The Master kit focuses on Red wines, White wines, and Champagne. The kit was developed by French wine expert Jean Lenoir. Make Scents of Wine / Le Nez du Vin is an instructional and educational guide that has been an indispensable tool for wineries, merchants, and educators for over 30 years. The Master Kit is a required course material at many of the great oenology schools. The price of the kit was pretty spendy. With Chris’ encouragement I decided what the hell, I’m going for it. If I really want to enhance my “nose“, I had to use what the pros do. I ordered the kit on-line and it showed up a week later. 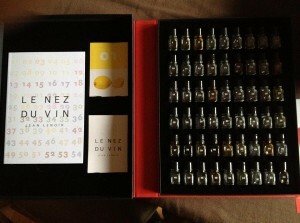 The kit contains 54 vials of the three aroma groups. Primary aromas, which originates in the grape itself. Secondary aromas, those which are aerobic (happens in air) and are due to the wine making process (this includes barrel aging). Tertiary aromas are those which develop in a reductive environment (without air) in the sealed bottle, over time, these are what is usually called “bouquet”. The kit also includes an instructional book, instructional cards, and a red cloth-bound case. The day the kit showed up I immediately started having fun. I pulled a few vials and started giving them a sniff. To my surprise, it was a swing and a miss on the basic fruity flavors. I was really surprised how depended you really are on all of your senses. You would think you could pick up on Pineapple or Lemon. Not me, I missed right away and so did Chris. I have learned to shake the vial prior to opening it. If you do not the vial may not be as aromatic. One thing the book does a great job at is it explained at a very basic level how to associate spells of the fruit. It describes the first thing you need to do when sniffing a vial is try to determine what group the scent is part of. Does the scent belong to fruity, floral, vegetable, woody, spicy, animal or toasty? What I have done with Strawberry is recall the smell of Strawberry milk. As a kid and young adult, I loved drinking Strawberry milk. Once you start associating the scent it does help. Chris is having fun too. I often grab a vial for her to smell. So far she has done a better job than me, she is a great chef and can relate because of her food passion. My goal is to learn a couple of scents a week. I figure by late fall, I should have a good grasp of the scents. I am looking forward to associating the scent in the glass before I give it a sip. Once I have this mastered, I plan on purchasing the 12 Aroma – New Oak Casks Kit. Maybe this will be on my Christmas list?